ISIS – A Factor in Gog & Magog? | Looking for that Blessed Hope! ISIS – A Factor in Gog & Magog? The war of Gog & Magog is still sometime yet in the future, but unlike in the distant past, today all of the countries that participate in this coming war are now in the news. Based on the verse below, it seems this war will mark the beginning of the Tribulation for God’s fury and wrath are held no more when Gog advances on Israel and His judgment will begin ushering in a 7 year covenant signed with the Antichrist, Israel, and many of the nations (as in the EU). And it shall come to pass at the same time when Gog shall come against the land of Israel, saith the Lord GOD, that my fury shall come up in my face. For in my jealousy and in the fire of my wrath have I spoken, Surely in that day there shall be a great shaking in the land of Israel;Eze 38:18-19. After the fall of Russia and Iran, the EU can then come to full power with the Antichrist at the head. The only question is what of China during that time? Immediately after the supernatural destruction of the enemy, the Antichrist will propose a Covenant with Israel and probably the EU and other nations (covenant with many Dan. 9:27). The weapons from the invading force will be burned by “they that dwell in the cities of Israel” for a total of 7 years. This is no coincidence since the Tribulation last for 7 years. It is interesting to note that other people live in Israel besides the Jewish population and during this time Israel’s borders will be much larger than they are today. The wording of “they that dwell in the cities of Israel” could mean the Israeli’s or others and is a very unusual way for the Lord to make mention of His people if in fact that is what it means. The very mention of cities seems to indicate a large area of land and today Israel is no larger than the state of New Jersey. Even more convincing is the verse indicating the “house of Israel” and “all the people of the land”, a clear distinction of people groups living in the area. Sometimes visuals help us to see the big picture. How do we know that Israel’s borders will be bigger at that time? Scripture tells us. First, God told Abraham the boundaries of the promised land and they are much bigger than that of today. Here we see the promised land given to the nation of Israel extends from the Nile river in Egypt north and east to the river Euphrates. That would include the Sinai Peninsula, Saudi Arabia, Lebanon, Jordan, Gaza, West Bank, Syria and Iraq. Take a look at the rough map below. That is a lot of land…..
Second, before Gog advances on Israel, we are told Israel will be dwelling safely. Clearly this is not the Israel of today for they are continually attacked and harassed by the neighboring countries and settlements. 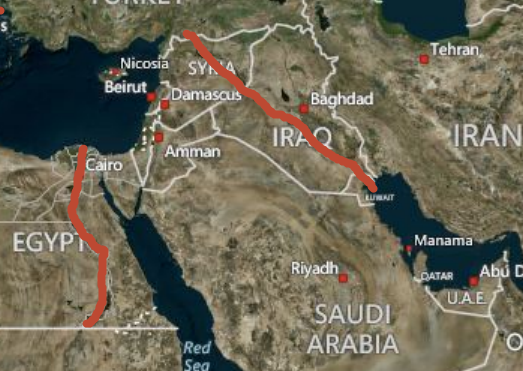 So how will Israel come to dwell safely and be at rest with expanded borders? The imminent Psalm 83 War. Again, let’s look at the map that consist of the enemies for this war. They are noted in green shading while the Gog coalition is noted in yellow shading. Note, for lack of space, Russia could not be fitted on the map. The mapping may not be exact, but you get the picture. Looking at the map above we can see these are two separate wars. The reason those countries in green do not join with Gog is because this area will be under Israel’s control at that time having defeated those countries in the Psalms 83 war and expanding their borders to what God promised Abraham. Look again at the promised land map. Very similar. Israel will continue to grow in power and economic success as we approach the end. For the Gog war, the individual countries highlighted in northern Africa are not a threat by themselves to Israel as they stand today. Something will have to unite them. What could that be? Perhaps ISIL? Let’s now turn to the territory that ISIL says they will claim for the caliphate. It is very similar but, expanded from the previous expansion of Islam during their peak in the mid 700’s A.D.
As one can see, ISIL plans to take the top half of Africa. Boko Haram, the extreme Islamic terrorist in Nigeria has already declared a caliphate there and is thought to pledge allegiance to IS. While Nigeria is not one of the countries listed in the Gog war, is it a hint of what’s to come? All of the countries involved in Gog based in Africa are already predominately Muslim and are currently experiencing some form of chaos or upheaval as Islamic in-fighting continues to “spring” around the globe. 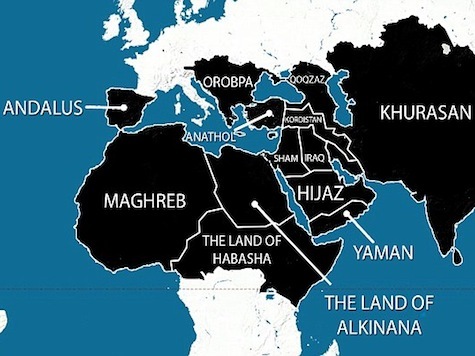 Will ISIL unite these countries for one final push against Israel after the Psalms 83 War? The situation in the Middle East is far worse with ISIL as they have in a short time, conquered much of Iraq and Syria and now have their eyes set on Lebanon while threatening the U.S There is also a Civil War brewing between Al Qaeda and ISIL to determine who will be king of Islamic Jihad. The area is a tense cauldron waiting to boil over onto Israel who will not stand by, but will retaliate and conquer this area – it is God’s Word, it will be done! Although it will certainly get worse in the future, it is very conceivable that we are witnessing the beginning of the end for Islam. Think about this. Between the war of Gog and Psalms 83, 90% of Islam will be destroyed and subdued. How will it stand after such defeat and the only way for the New World Order to rise into power is for the removal of chaos; the removal of Islam. Ironically, shortly after the removal of Islam, the world will experience the most chaotic time in its history. Read Ezekiel chapters 38 and 39 for more detail on Gog and Magog. Lakhdar Ibrahimi: The Next President of Algeria? In June, Tunisia’s interior minister estimated that at least 2,400 Tunisians were fighting in the country, mostly as members of the Islamic State. This entry was posted in Gog & Magog, Prophecy and tagged Caliphate, Gog & Magog, ISIL, Israel, Prophecy, Psalms 83 by atharris. Bookmark the permalink. Pingback: Ezekiel 38 (Gog and Magog) on the Horizon | Looking for that Blessed Hope!